A new online training course was launched by the Australian Honey Bee Industry Council (AHBIC) and Plant Health Australia this week, to make it easy for beekeepers to find out how to care for honey bees in accordance with the new Australian Honey Bee Industry Biosecurity Code of Practice. The Biosecurity for Beekeepers course explains why biosecurity is important to beekeepers, describes the main pest threats to hives and shows how to check hives for any sign of pests that can reduce bee numbers. It is designed for people with a basic understanding of beekeeping practices, and all beekeepers will find it helpful. AHBIC chairman, Lindsay Bourke, said that the course coincides with the introduction of the new Australian Honey Bee Industry Biosecurity Code of Practice so that all beekeepers can learn about the code’s requirements and make sure that their practices meet the Code. 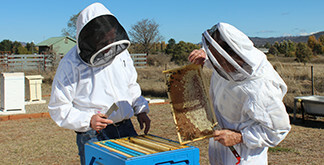 “All commercial beekeepers are encouraged to complete the course,” said Mr Bourke. Plant Health Australia’s honey bee biosecurity project officer Dr Jenny Shanks said that the course is straight forward and gives beekeepers all they need to know. “It should take around 90 minutes to do the course, and it can be done in more than one sitting,” Dr Shanks said. This key element in improving bee biosecurity in Australia has been funded by AgriFutures Australia and the Australian Honey Bee Industry Council.